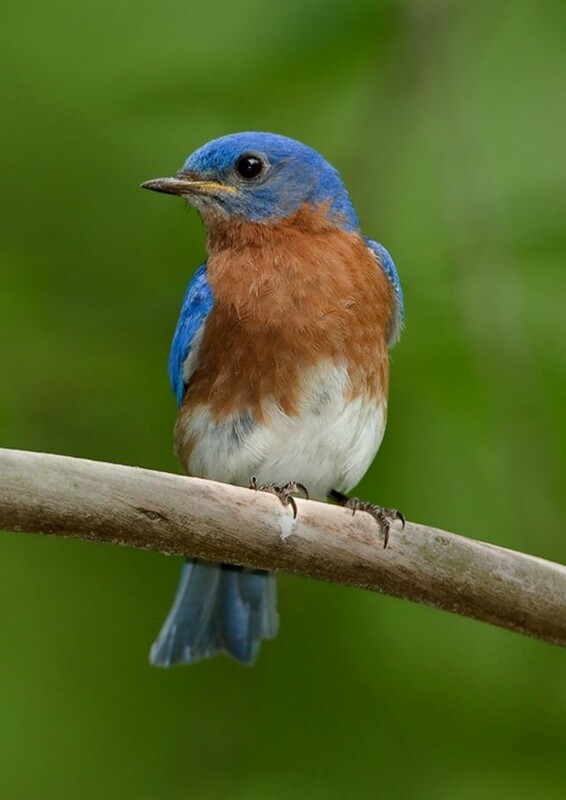 Bluebirds are cavity nesters, making their nests in abandoned woodpecker holes and in the natural cavities of old trees. They were very common at one time, but their numbers decreased dramatically due to habitat loss and from competition for nesting sites from introduced species such as sparrows and European starlings. Fortunately, bluebird numbers are rebounding in recent years, primarily in thanks to the placement of suitable bluebird houses. In areas where old trees and woodpecker holes are hard to find, bluebirds will readily accept nest boxes to raise their young. 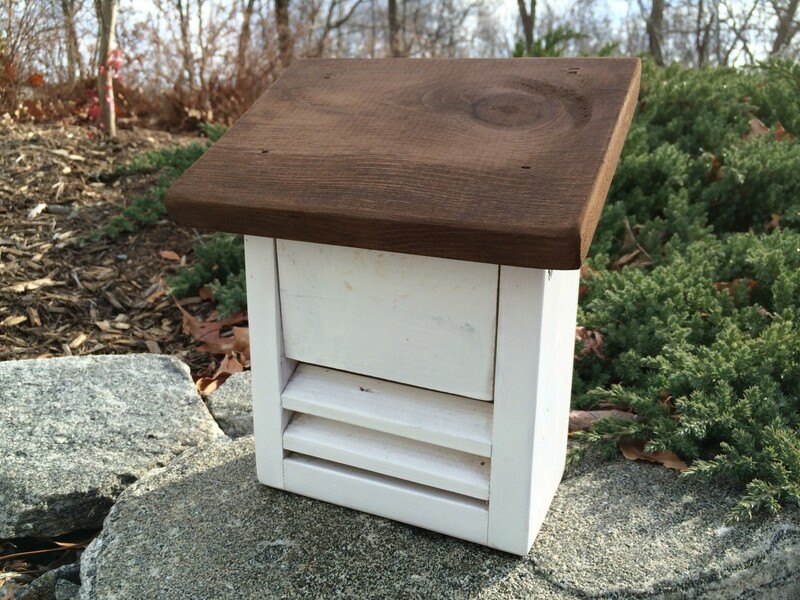 Bluebird houses are easy to build from cedar, redwood or pine. 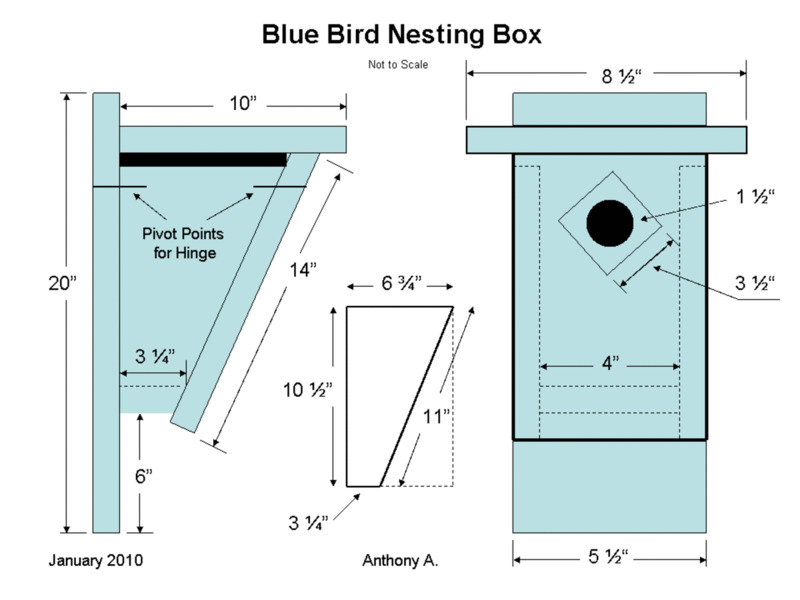 To attract bluebirds, the dimensions of the nest box are very important. The size of the entrance hole is especially important: 1-1/2" diameter for eastern bluebirds, 1-9/16" diameter for the western bluebird). In northern areas of their range, bluebirds begin to nest in early spring so it is also important to place your bluebird houses by late winter. 1 - Entrance guard (F) 3" W x 3" L.
Cut a 22-degree bevel across the top of the front section (A). 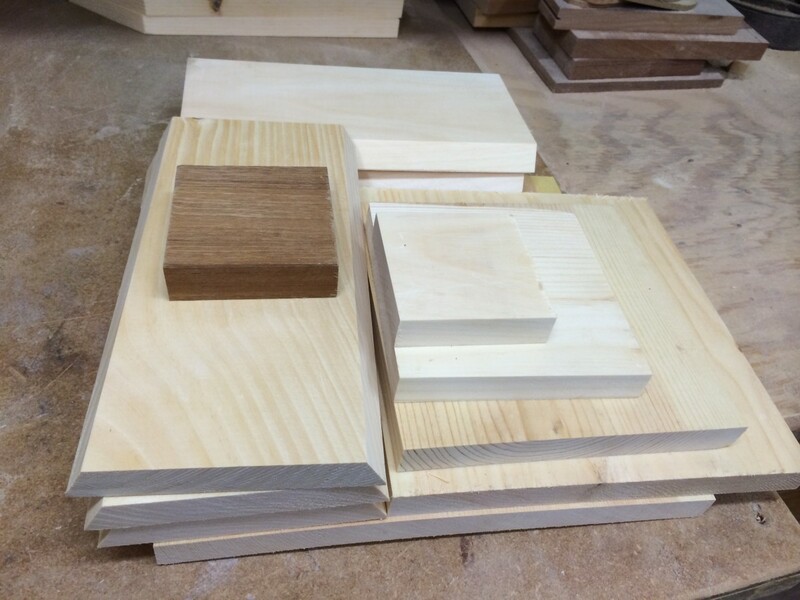 The 22-degree bevel sets the angle of the slope for the slant front birdhouse, and will match the angled cut for the side pieces (C). Layout and the drill the 1-1/2" entrance hole in the front (A). Measure up 11" from the bottom edge, centering the entrance hole across the width of the front section. Use a Forsner bit, hole saw or paddle bit to drill the entrance hole. Lay out the angle of side pieces(C). 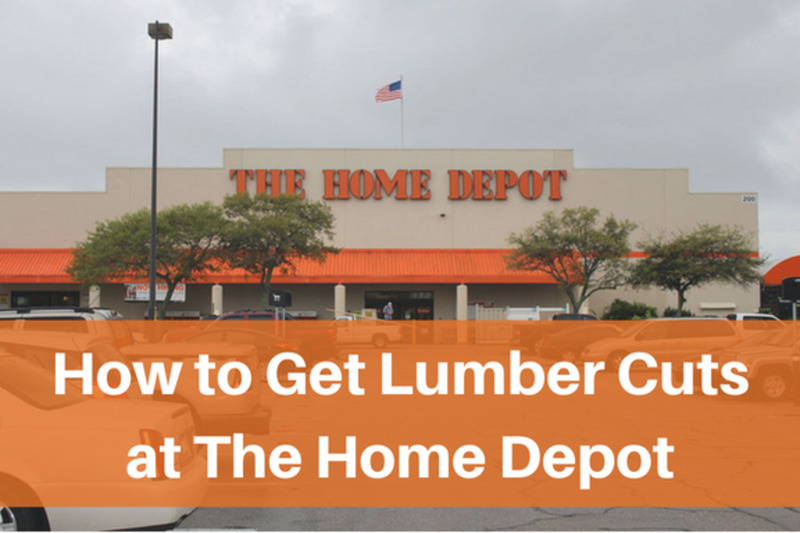 To determine the angle of the cut, measure 3-1/4" from one end of a side piece. With a straight edge, draw a line from the 3-1/4" mark on the bottom edge to the top corner. This represents a 22-degree angle to create the slanted front of the nest box. Cut along the line to create an angled side piece. Repeat the angled cut on the second side (C). Form the bottom (E) from a small piece of stock, cutting a 22-degree bevel across one edge. Measure 3" from the top edge of the bevel, and cut the bottom section to its finished length. Drill several 1/4" holes through the bottom to allow for drainage. Begin the assembly by attaching the bottom (E) to one of the side pieces (C). Line up the bevel of the bottom piece to the angled edge of the side, and secure with weather resistant nails or screws. This is the fixed side, while the other side is hinged to allow access to the finished birdhouse for periodic cleaning. Line up the second side with the opposite side of the bottom, then drill and countersink a screw along the center of the bottom edge. This single short screw will secure the side, which will form the door of the birdhouse, yet allow easy access for cleaning. 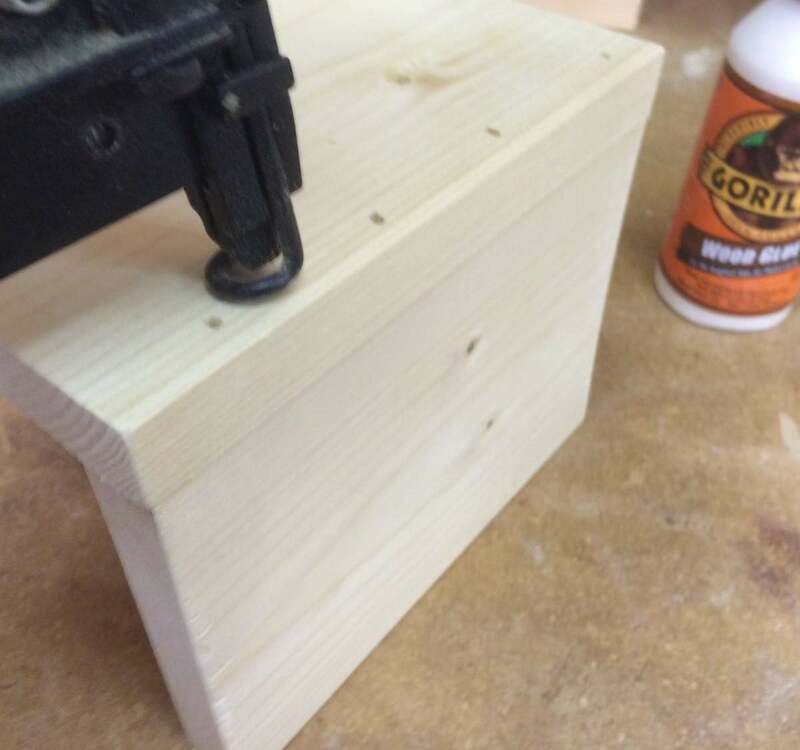 Lay the partially assembled birdhouse on its back edges, and position the front (A) along the angled side edges. The front will extend 1/4" above the sides, creating a space for air circulation. Attach the fixed side (the side without the single screw) to the front, using nails or screws. Then attach the door side (the side with the single screw) and create one side of the "hinge" by securing the side section to the front assembly with a single nail driven into edge approximately 1" down from the top. Measure up 6" from the bottom edge of the back section (B). 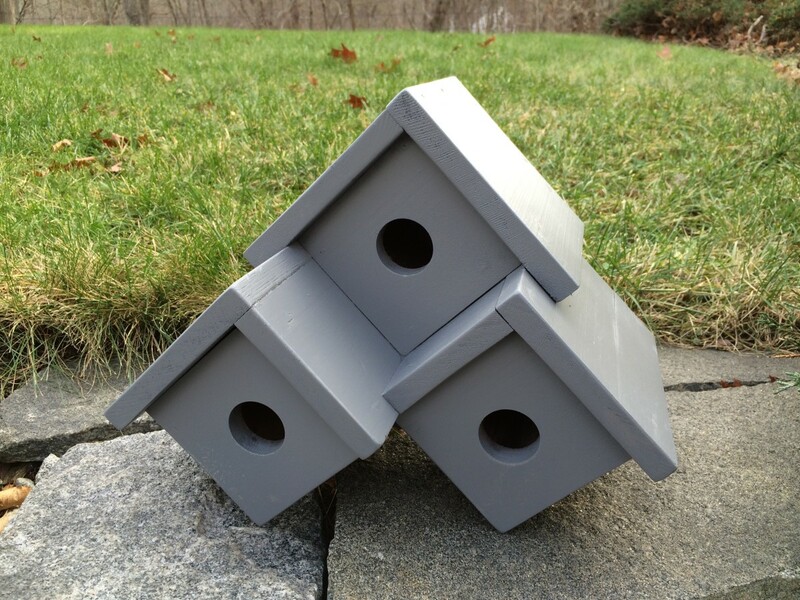 Lay the birdhouse on its front, then position the back section so the 6" mark is lined up with the bottom of the birdhouse (E), and attach the back to the bottom with nails or screws. Use more nails or screws to attach the fixed side to the back section.Finish attaching the hinged side by driving a single nail through the back (B) and into the door side, forming a pivot point. Position the hinge screws in the front and back sections directly across from each other, enabling the door to open easily (refer to the side view drawing). Attach the oversized roof to the back and front sections. The large roof creates overhangs along the front and both sides to protect the birdhouse box from rain. Drill a 1-1/2" hole into the center of the entrance guard (part F). Round off the edges with sandpaper, or use a round over bit to create a finished edge. Attach the entrance guard on a bias for a visually appealing diamond shape. 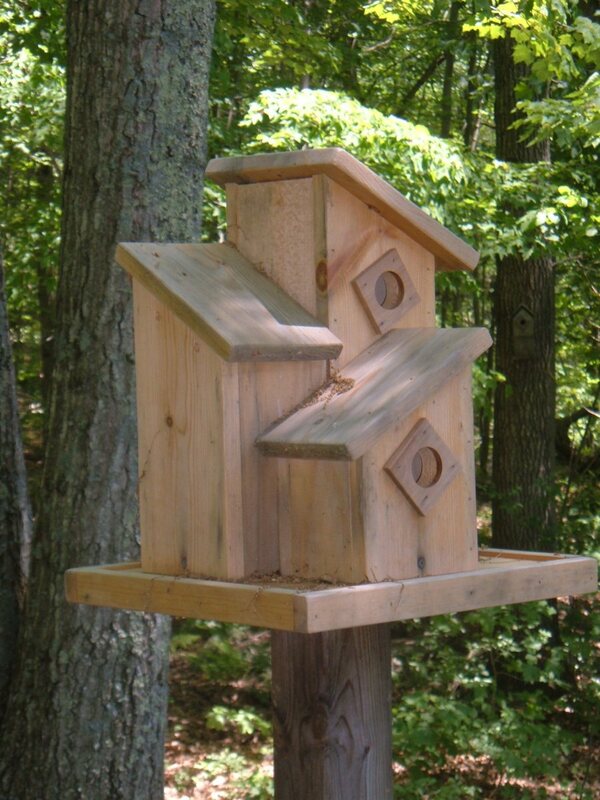 Mount the finished bluebird nesting box between 5' to 10' above the ground. For The blue bird house should face out towards an open field or grassy area. 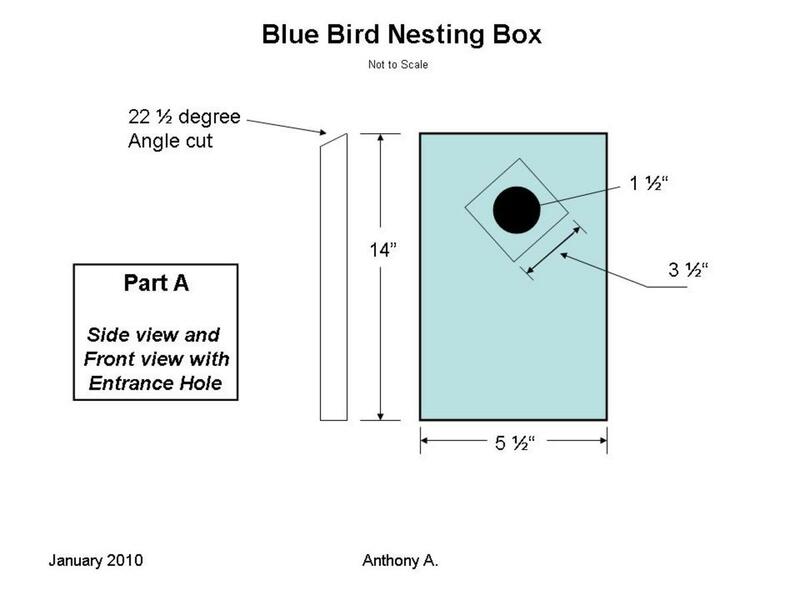 One of the most critical elements of a bluebird nest box is the size of the entrance hole. If the hole is too small, bluebirds cannot enter the nest box. If the size of the hole is too large, bluebirds might be forced out by the larger more aggressive sparrows and starlings. Eastern Bluebirds: Use nest boxes with a 1-1/2" diameter entrance hole. Mountain Bluebirds: increase the diameter of the entrance hole to 1-9/16". Western Bluebirds: will use either size, though some bird watchers report a higher success rate when using the 1-9/16" diameter entrance hole to the nesting box. Do not use nest boxes with a 1-5/8" entrance hole, which is large enough for the bigger and more aggressive starlings to enter. Bluebird populations suffered and declined in the 1960s, but rebounded with the help from concerned birdwatchers. 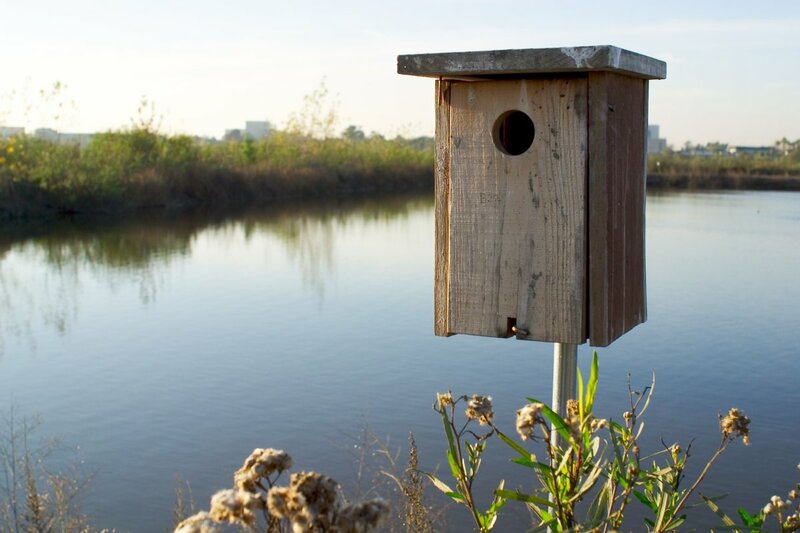 The North American Bluebird Society was formed to encourage and instruct and encourage people to build and hang bluebird houses. Bluebirds eat bugs and berries, but are not attracted to bird feeders filled with birdseed. Bluebirds like mealworms, and will visit feeders filled with live or freeze-dried mealworms. Bird watchers and gardeners try to attract bluebirds into their yards, both for their beauty and for the beneficial role they play by eating many different types of insects. Bluebirds inhabit open spaces in rural areas, and they are often found near fields, pastures and in open areas at the edge of woodlands. They can also be enticed to visit gardens that cater to their basic needs while providing an environment to make them feel safe and secure. Our garden strives to provide the four essential requirements for bluebirds and other feathered visitors: Food, Shelter, Water and Nesting Areas. Plantings include a mixture of native and cultivated perennials and shrubs, planted along and under the mature oak trees where the birds can find berries and hunt for bugs. 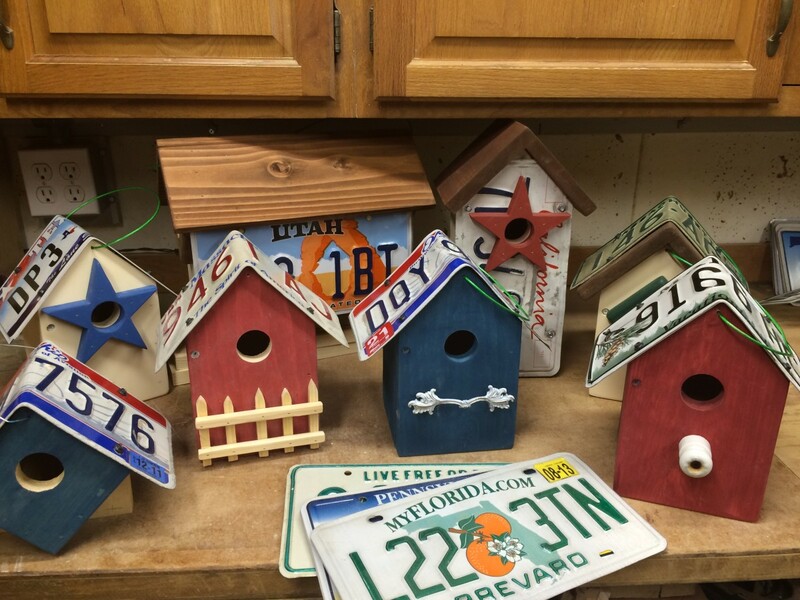 Do you have a Bluebird House in your yards? No, there aren't any bluebirds around here. Not yet, but I am going to get a Bluebird House! For over 35 years, the National Wildlife Federation (NWF) has encouraged homeowners, schools, corporations and municipalities to incorporate the needs of the local wildlife into their landscape design. So far, the NWF has recognized the efforts of nearly 140,000 individuals and organizations who plant native shrubs and plants for food, cover and places for raising their young, provide include a source of drinking water, and add nesting boxes for cavity nesting birds. 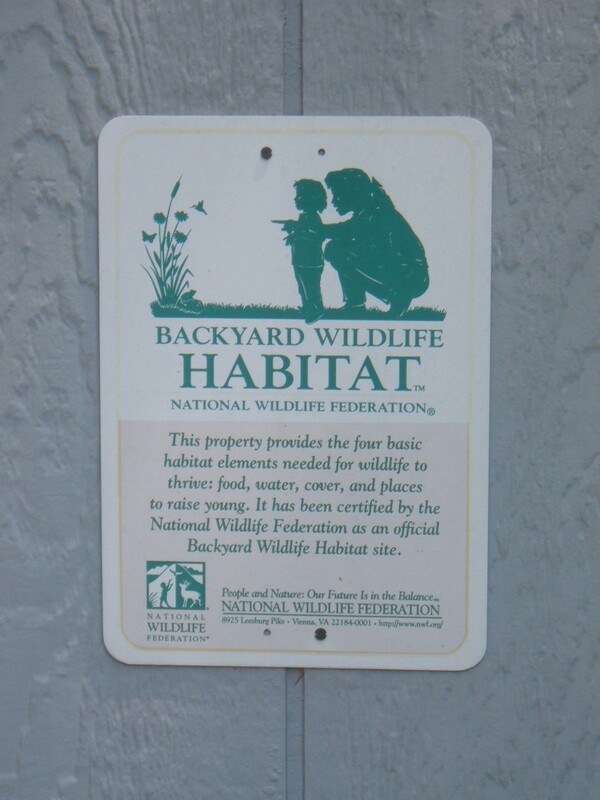 For more information on how you can attract more wildlife, and to certify your yard and gardens, please visit: National Wildlife Federation: Certify Your Wildlife Garden. 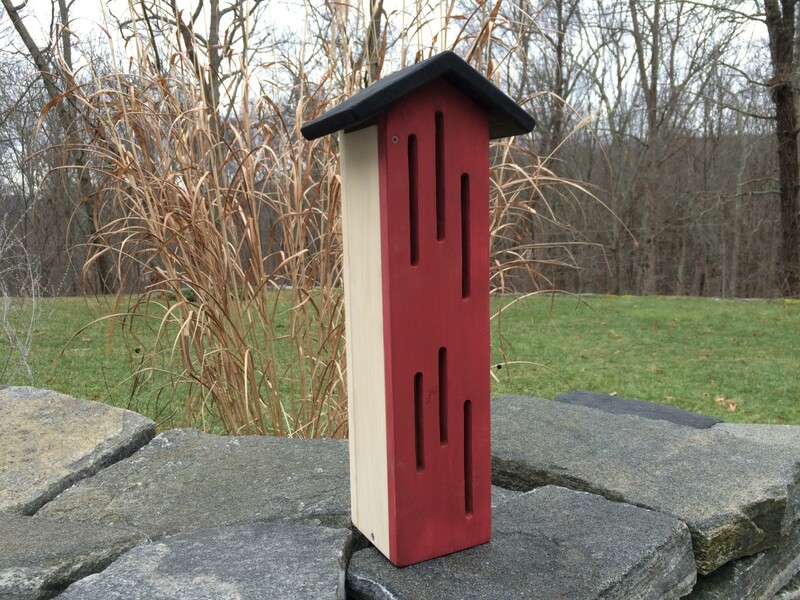 How high above ground level is best for a blue bird house? Bluebirds can be very selective when looking for a place to raise their young, and location is an important consideration. We have been successful in attracting bluebirds to birdhouses that face open areas of our yard and are attached securely to posts and trees between 6' to 8' feet above the ground. We do not have the tiny blue birds here but we do have the beautiful (and rather screechy noisy) blue jays who absolutely love the cherries on our cherry tree. My hubby gets a little hot under the collar at them every now and then but I really don't mind sharing our garden's bounty. We never pick the top of the tree anyway. Its interesting that you had a family of flying squirrels move in when you moved a bluebird house deeper into the woods, they are cute little fellows but not what you were trying to attract. I also found it interesting that you had a variety of bluebird house styles and they chose the slant front style here last year, it will be fun to find out what they choose this year. 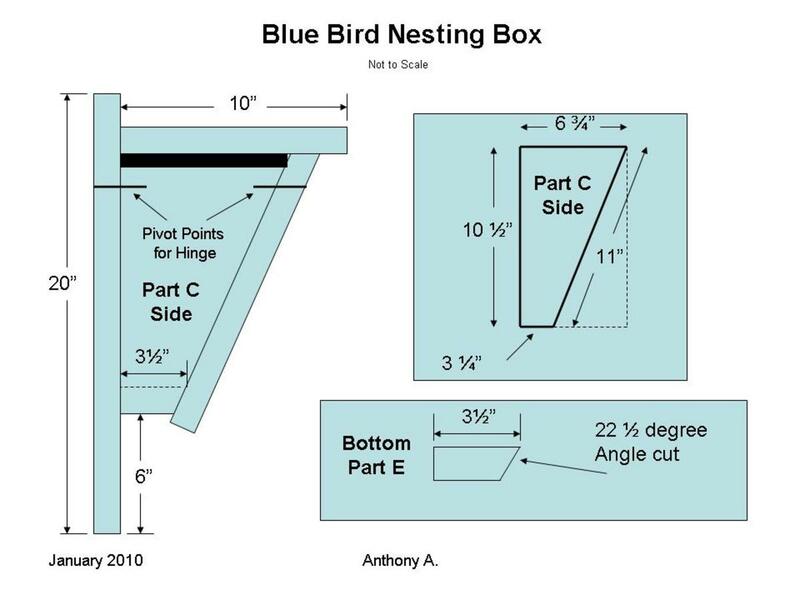 Appreciated these plans for a bluebird nesting box. I have at least two pairs of Mountain bluebirds each season. Right now, the birds are using my nesting cavities that are made from hollowed out aspen logs. Finding your lens was timely as I am preparing additional nesting boxes this year. Thank you! We have Blue jays who visit us, or should I say visit our cherry tree, but they are large so I think they nest rather than live in houses. The blue jays are a very pretty bird but noisy whereas a tiny blue bird would have such a much nicer song. I still like to see the blue jays in our cherry tree though. They are funny sometimes the way the talk to each other. @anonymous: Hi, and thank you for your suggestion! 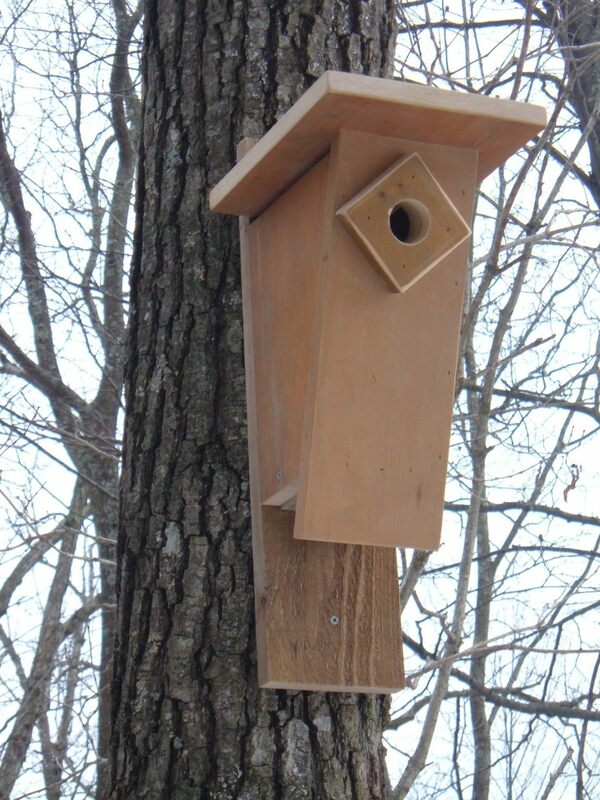 I have several different styles bluebird houses scattered around my yard and this year, they chose this box.I moved one of my older bluebird nest boxes a little deeper into the woods, and a family of flying squirrels moved in! 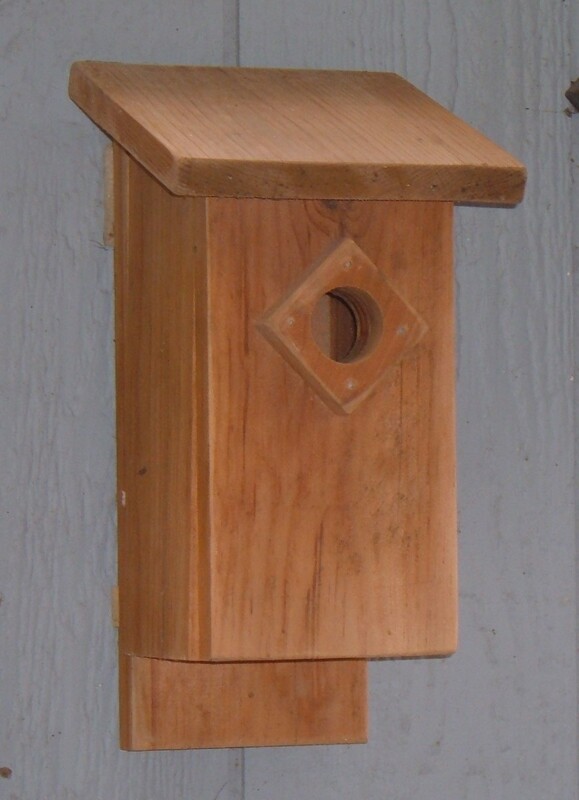 I just learned from a man who builds this slant front type of bluebird nests that once you set them out to be sure and clean them out every day before bluebirds arrive because if another bird even puts one piece of grass or a twig in it, the bluebirds won't use it. He also said, as you do, to face the nest toward a field or other open area. Well done.